ooooooohhh......love the card and the challenge! Fun card. Your trees look great. Awesome, bright card! I love this! This is so cool Kristie! 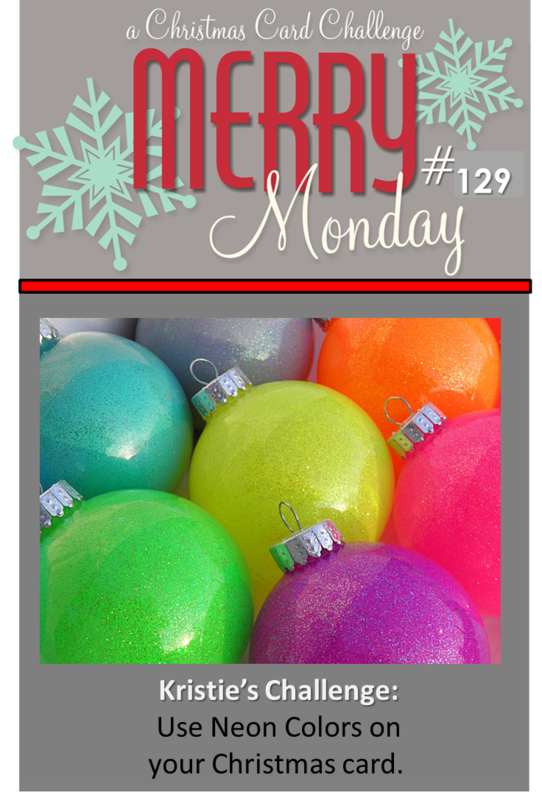 Great choice of sentiment - this font totally works with the retro colors and the inlaid Christmas trees. It seems that there are a lot of non-traditional colors showing up in this year's Christmas scene! I love the use of Neon on ur card, simply fab! Kristie, I couldn't love the bold simplicity of this card any more than I already do. It is super-chic and so much fun! Great challenge, Kristie! And your card is equally as great! Love the layout and those overlapping trees look just perfect! I rather like those neon trees, Kristie. It's not something I would have thought of doing but I like it. I love your neon, Kristie! Wish I had some of it. Thanks for challenging me. Have a wonderful, crafty week! Fun, fun, fun! Such a fun card - great challenge too!! Very clever to add the black along with the neon, everything just pops. Fabulous card! Oh wow!! So modern and funky! This is fabulous Kristie!! Awesome card, Kristie! 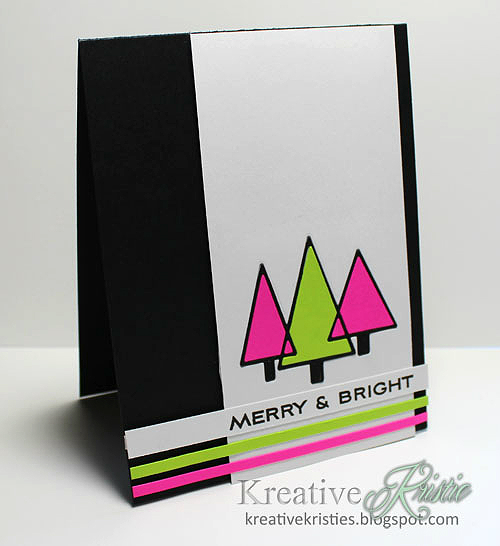 I love your choice of neon colors for your trees and how you've outlined everything in black...very cool! ADORE this!!! yay!! what FUN! Yes WOW this is fabulous - so bright and brilliant. Great cas card. Wonderful card Kristie, I love these fun colours against the black background. Oh, I love this! So eye-catching! WHat a fun challenge. The neon is such a great twist on Christmas. Great modern Christmas card Kristie! Thanks very much for dropping by my blog. Fun design especially with the twist of neon trees! Thanks for dropping by my blog! Fabulous neon card Kristie. The black is perfect with the pretty colors. Gorgeous & striking--LOVE this card, Kristie! These colors on the black card base are absolutely stunning!! Kristie, you outdid yourself with this one! Wowser!! This is such an AWESOME card with neon! I adore your composition and inlaid die cut, Kristie! So glad that you join the fun over Virginia’s View Clean and Simple Challenge!